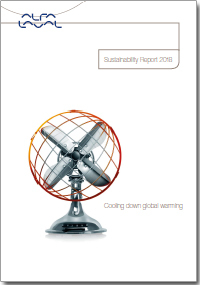 Alfa Laval's Sustainability Report focuses on material topics and activities in line with stakeholder concerns. The report describes the policies, risks and results of the company's material topics regarding the environment, social issues, employees, human rights and anti-corruption. Alfa Laval has been a signatory to the UN Global Compact since 2011, and complies with its ten principles for responsible business. The Sustainability Report is Alfa Laval’s annual Global Compact Communication on Progress about how we live up to, and work with, these principles. This is the first year Alfa Laval reports on sustainability activities in accordance with the Global Reporting Initiative (GRI) Standards: Core option. The Sustainability Report together with the risk section in the Alfa Laval Annual Report 2018 fulfil the requirements in the Swedish Annual Account Act. Our Business Principles describe our aspirations regarding our environmental, business integrity (ethics), social and transparency performance. Alfa Laval’s Sustainability work is based on our Business Principles. The report highlights our objectives in different sustainability areas, our yearly progress and how our products and solutions can contribute to sustainable development. Read the highlights, dive into the cases and when you are done – don’t forget to tell us what you think! Certain matters discussed within this website (including any documents posted or incorporated hereon) are forward-looking statements. Forward-looking statements are neither historical facts nor assurances of future performance. Instead, they are based only on our current beliefs, expectations and assumptions regarding the future of our business, future plans and strategies, objectives, projections, anticipated events and trends, the economy and other future conditions. Forward-looking statements can be identified by words such as: "anticipate," "intend," "plan," "goal," "seek," "believe," "project," "estimate," "expect," and words of similar import. Because forward-looking statements relate to the future, they are subject to inherent uncertainties, risks and changes in circumstances that are difficult to predict and many of which are outside of our control. Our actual results and financial condition may differ materially from those indicated in the forward-looking statements. These factors should be considered in evaluating any statement contained herein or made on our behalf, and you should not rely on any forward-looking statements. Any forward-looking statement made by us on this website is based only on information currently available to us and speaks only as of the date on which it is made. We undertake no obligation to publicly update any forward-looking statement whether as a result of new information, future developments or otherwise.